Obviously, by this, we do not refer to the cold weather we’ve endured for the past weeks, but we refer to the term, the hype, that everyone is talking about: cloud hosting and cloud computing. Do you not know what we are talking about? Do not worry, because you are not alone! A survey conducted by research company Portio revealed that 56% of the European IT decision-makers do not know what cloud computing means. And yet, this new technology has many benefits for your company. 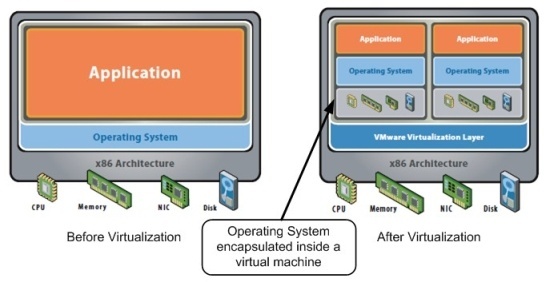 The technique: virtualisation, what is it? Cloud Hosting is based on the concept of virtualisation. This technology eliminates the direct dependence between the software and the hardware that runs this software. The idea of cloud computing is indeed to focus not on hardware, but on what your application or website needs: memory, computing power, storage capacity and bandwidth. The word “cloud” refers to the Internet and the parts and the actions that are not exclusively carried out via one single machine or server anymore. - Scalability means that you can increase or decrease the power of the computer as you please. Instead of having your own server with a predetermined capacity, you rent each month the capacity that you need. This comes in handy for e.g. a web store during busy periods such as Valentine’s Day and the end of year holiday period. - Efficiency (also in price): you only pay for the capacity that you really use. That will make you save a lot of money. This way, you do not pay for servers that you need perhaps just a couple of times a year to ensure availability during this busy period. - On demand: at any time, you can increase or decrease the computing power that you need for your application or server. Operational and financial flexibility is one of the main benefits. Each month, you pay according to your needs, according to the “Pay-as-you-grow” principle. In addition, you are no longer the owner of the hardware that must be replaced after a period of three years or even less. Cloud hosting is definitely not expensive. The rates for virtualised systems start at 28 euros per month but can vary a lot depending on the customers’ personal demand. This rate goes up depending on the general use (processor, memory, storage space, etc.). For projects with specific requirements, the range includes high availability and a multi-data centre solution. This concept works as follows: we install a server in data centre A and a copy of the server in data centre B. If data centre A fails, data centre B takes over immediately, in order to make downtime almost inexistent. For such solutions, the price is custom-made, depending on the customer’s needs. In recent months, with Combell, we held several sessions on Cloud hosting at different events. Each time, we noticed that the demand for this new technology and an efficient way to host is growing. Meanwhile, Combell already gained a lot of expertise in the field of cloud computing. The company has been offering Software-As-A-Service (which is based on the principle of Cloud computing) for quite some time now: instead of investing and locally installing and maintaining a program or service, you pay a fixed monthly fee and the environment runs on our servers. So, there is no need for local storage, installation, maintenance, backup, etc. anymore. Many of our new services such as Hosted Exchange, Online Fax, Microsoft SharePoint hosting and Online Backup are based on this principle. Our servers work in virtual mode thanks to technologies developed by renowned suppliers such as VMWare, Hyper-V and Parallels. Contrary to foreign actors such as Google and Amazon, Combell offers its private cloud services based on a monthly fee. That system is better suited to the needs of our customers who want to e.g. have their capacity increased quickly or set up a marketing campaign. For them, swiftness is the most important criterion. With some technologies such as DRS (Distributed Resource Scheduler) by VMWare, it is possible to duplicate servers in no time. Combell uses it to offer clustering and high availability. If a server crashes, it is duplicated and rebooted somewhere else in the Cloud. In the meantime, at Combell, 44% of the client servers are run in virtual mode, while in 2007, this percentage was only 3%. Since a few months, Combell also offers the multi-data centre solution in virtual mode, in order to be able to offer high availability, security, capacity and flexibility to large companies and online specialists. Thanks to our procedures and since the necessary infrastructure is already present, we can guarantee their installation in less than 24 hours. Another huge difference with e.g. Amazon is advice and management. At Amazon, you must indeed do everything yourself. It is expected that Cloud Computing will gain much popularity in coming years. Renowned research firm Gartner says Cloud Computing will become 2010’s hottest trend. The number of companies that use Cloud Computing will not stop growing in coming years. Is your company ready for the future? Enter the cloud now! Lost in the Cloud? Call our Cloud specialists for personalised advice: 0800-8-567890.